Here it is with logos, for all you bronies to enjoy! A full 10,800 pixels on the vertical side. I would have uploaded a larger one, but dArt maxes out at 10.8k. Did you print this at 300 dpi or 72? I'm new at poster printing. Attention, MLP, FiM bronys. 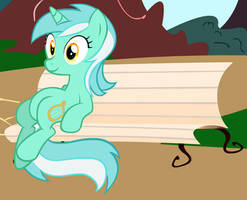 Give a big round of whoofing for the BASE CROWD PONYS for seasons 1-3. Okay, I give up: Where´s Waldo? And where I srainbow Dash's pet turtle, Tank? You... what have you done! For some reason, I'm having problems seeing this picture in higher resolution. I opened 2 copies of the 30k one, it used 4GB of ram plus about 8GB Page file on my hard drive, second one is not loaded yet. Anyone knows about a image viewer which could take that gigantic picture? The stock Windows image viewer takes AGES to load. Hey, I see me any my two best buds, Hoops and Quarterback! Ugh, why does Rainbow Crash get to be in front? his name is Ace... he plays tennis. every though of doing one of loads of das ocs just a wonderin cuz that would be AWSOME. Going to make a huge poster with this picture, Thanks! Huh. 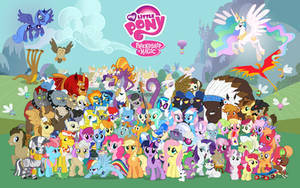 You never notice while watching it but y little pony has a fairly sizable cast of characters. i was wondering who was riding the air balloon! Looks like new characters for season two! Those ponies in the air balloon are your OCs since I read one of the previous comments. The red and black pony in the hot air balloon... I never saw them before, who are they? The artists? In this version, yes, Myself and Moongaze. Who are the red and black ponies in the balloon? My own and Moongaze's OCs. We released a separate version with official characters. wheres tinkatinkatoo? or candy floss? WHERE HAS ORIGIONAL GOT TO?? Every single generation has different characters. Well true, but it's only a sometimes thing when they re-add characters. They added Cheerilee, Sweetie-Belle and Applejack too, just changed their appearances and personalities. Even ages!